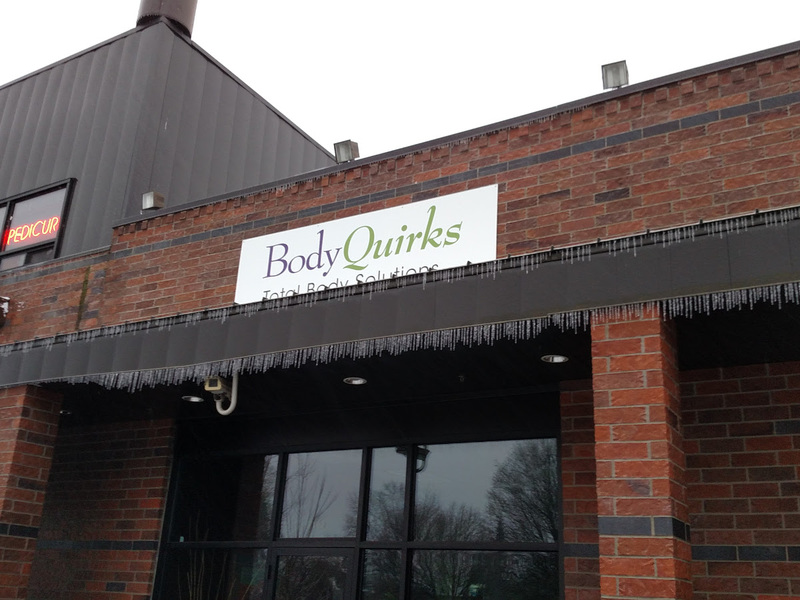 BodyQuirks is a wellness studio with a whole new twist on fitness. That’s because licensed massage therapists and co-owners, Esther Bell and Tara Krupich opened BodyQuirks Wellness and WBV Studio in the spring of 2014 as an alternative to the gym scene. They wanted to offer a safe space where everyone, no matter their size, shape, or fitness level could improve their overall wellness – without judgment. Since then, their whole body vibration (WBV) studio has been helping Eliot neighborhood residents up their game, getting healthier and even – happier. Whole body vibration training clients use state of the art 4G technology (that’s 4 times the G-force) to increase muscle resistance using gravity and the body’s own naturally stabilizing forces to create a whopping 97% muscle engagement with little or no impact on joints. It stimulates your muscles and reflexes, mobilizing and providing rapid heating to joints and muscles, improving their tone and function with very low joint impact. This is the very same technology that was pioneered by the Russian space program some 50+ years ago, with Russian Cosmonauts first using these machines to train before going into space (allowing them to stay up in space up to a year longer than our astronauts) and shortening their recovering times upon return, by using them once they were back here on earth. FDA approved since 1983, and used by American Astronauts, Olympians and professional athletes for years, these whole body vibration machines are now finally available to the public for use. Additionally, these WBV machines amplify the benefits of any weights you use while on them. For example, a 2-pound weight, when used on the machine, is equivalent to hoisting an 8-pound weight, accelerating your benefits, while minimizing your risk. Just standing on the platform you can feel your body’s muscle groups working differently, adapting to the variety of vibrational intensities as it works to engage core muscles and keep youin balance on the machine. Even small changes in posture or in knee or foot placement can make a big impact on your workout. Massage therapists since 1985 and 1999 respectively, Bell and Krupich have years of experience helping their clients overcome injuries or limited mobility issues, successfully regaining mobility and range of motion. They brought their first WBV machine into their massage practice a few years ago and never looked back. “We found clients who had been stuck in their recovery process, were gaining ground again and their overall recovery times were being cut significantly with the use of the machine,” says Bell. Krupich, whose mother has Alzheimer’s disease, also notes anecdotally, that she believes WBV may help improve cognitive ability. “After using the WBV machine at home regularly, she is now speaking more and learning new games, and it’s improved her balance. She rarely falls now,” Krupich says. BodyQuirks’ clients range in age from 14-88 and Bell and Krupich say the health benefits of WBV are far-reaching and enumerated in the many studies on WBV – from improved circulation and lymphatic flow, reduced arthritis and joint pain, to an increase in your “happiness hormones” (like serotonin, dopamine and endorphins, while decreasing stress hormones like cortisol) and increasing your body’s natural healing response. Even clients with Multiple Sclerosis and spasticity issues have seen marked improvement. Conveniently located right here in the Eliot neighborhood, BodyQuirks is the only full-service WBV studio in the area. Highly-trained staff are always on hand to provide guidance and tips to meet member’s individual needs and their studio doubles as a showroom, making machines for home use available for purchase to both members and non-members. You can call BodyQuirks at 503-233- 9030 or stop by the studio at 3311 NE MLK Jr Blvd Suite 102 for details. Eliot residents who mention this post will get a good neighbor discount, so contact them soon to schedule your free in-depth demonstration.